Si! 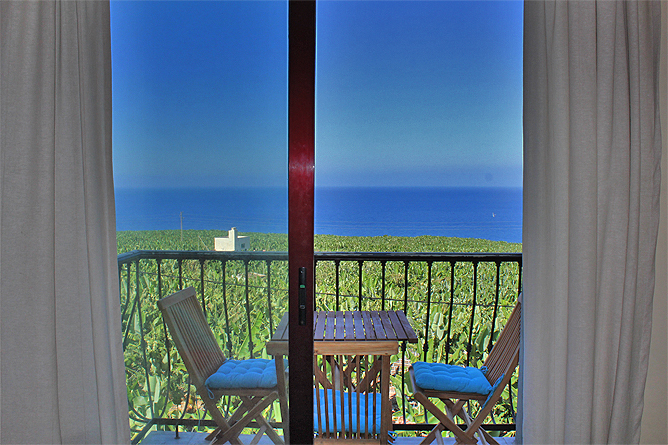 is a friendly and bright Holiday Apartment with a gorgeous sea view, from inside as well as from the balcony. The Holiday Apartment is situated on the outskirts of Villa de Tazacorte and still provides a central location in one of the sunniest areas of the island. The sea in Puerto Tazacorte is located within 5 driving minutes. The Holiday Apartment is ideal for 2 persons, however a third adult or a child can be comfortably accommodated. Apartment Si! 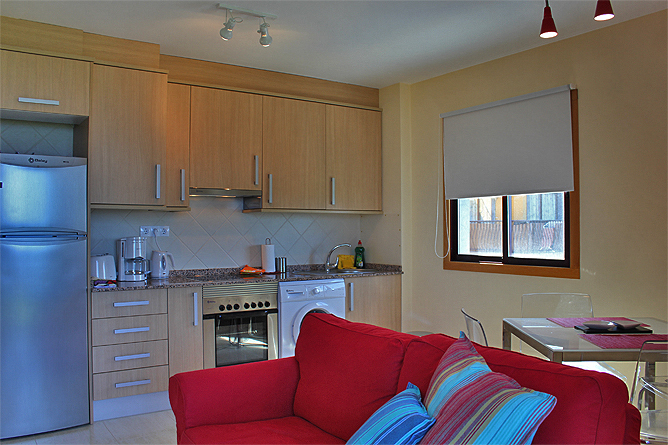 is located on the 2nd floor of the newly built apartment house San Miguel. 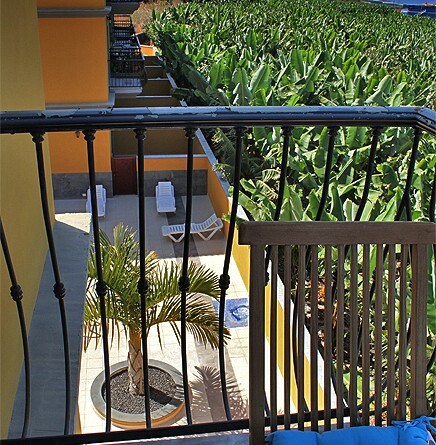 The living room and the balcony are facing west and offer a wonderful view of the green banana fields and the sea. Complete your day on the balcony and enjoy unforgettable sunsets. The kidney-shaped pool in the patio of the apartment building is shared by all tenants. The 9 meter pool also has a separate children's pool. 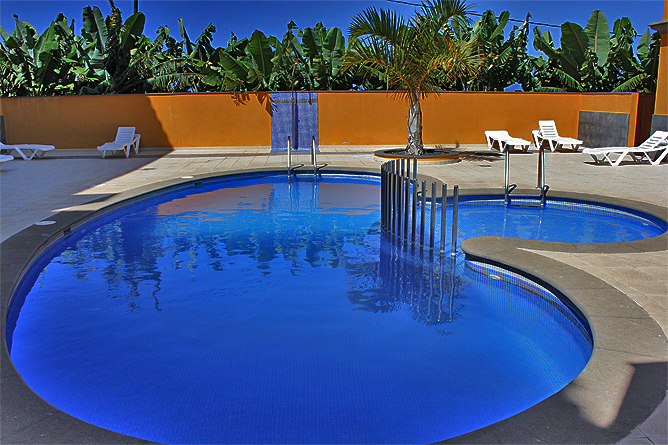 The pool area with the outdoor shower and the loungers is perfect for relaxing and sunbathing. The living area has a red 2-seater couch and a a dining table with 4 chairs. A small flat screen with German satellite TV is also available. There is a fitted kitchenette with a large refrigerator, a ceramic hob with an oven and a washing machine. The bedroom provides a south view towards the sea and the below shared pool area. 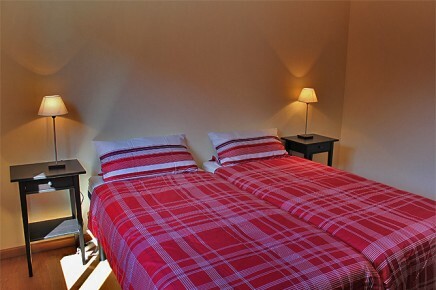 Two single beds with back-friendly mattresses are pushed together and make a double bed. 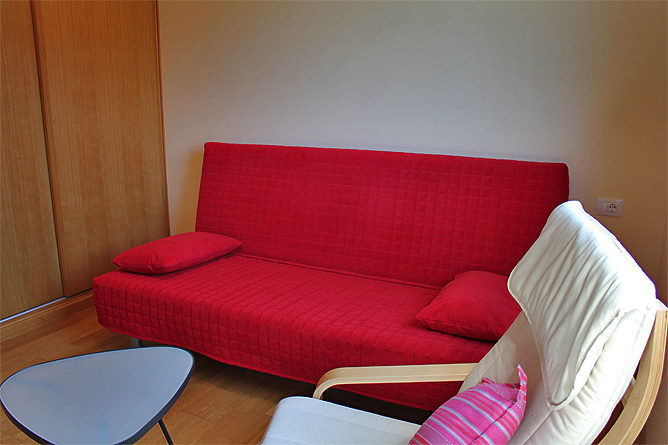 In the second bedroom there is a red sofa bed. This bedroom offers space for an additional adult or child. A large built-in wardrobe provides plenty of storage space and there is also a small desk. All rooms can be darkened with rolling shutters or curtains, if desired. The bathroom has a bath tub, a bidet, a toilet and a wash hand basin. 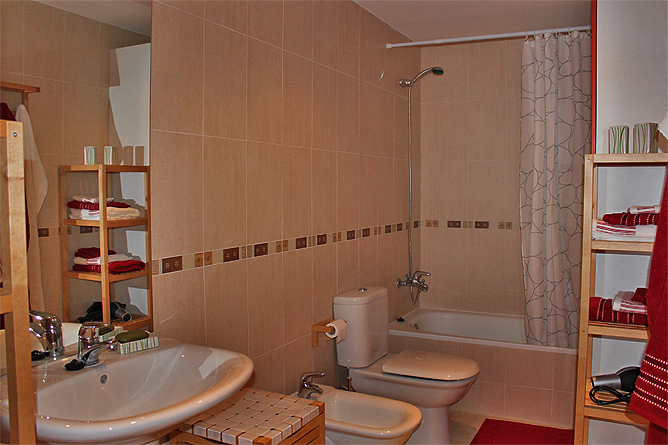 The cream coloured tiles perfectly fit with the light wooden elements. Glass sliding doors provide access from the living room to the balcony. 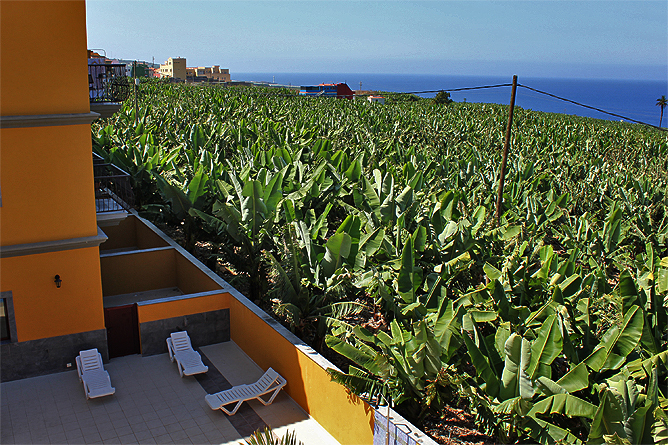 On a small table with 3 chairs you can enjoy your meals as well as a spectacular view of the green banana fields, Puerto de Tazacorte and the width of the Atlantic Ocean. please bring your own pool- und beach towels! Si! is a friendly, bright Holiday Apartment with 2 bedrooms and a balcony with a beautiful sea view. 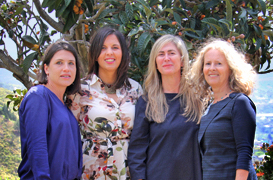 It is located on the outskirts of the village Villa de Tazacorte. Tazacorte is one of the sunniest regions of the island and is also a great starting point for active and beach holidays. In the centre of Villa de Tazacorte you find various supermarkets and good restaurants, all within a short walking distance. The new Plaza with a Kiosco (snack stand) is a nice place to enjoy a coffee and watch the village life. The large sandy beach in Puerto de Tazacorte is 15-20 walking minutes (3 driving minutes) from the Holiday Apartment. There is also a beach promenade and some very good fish restaurants, that serve every day a variety of freshly caught fish. Visit also Los Llanos with many shops, restaurants and bars, 8 driving minutes from Puerto de Tazacorte. There is also a regular bus to the main bus station. From there busses depart in all directions of the island. However, we recommend a rental car, as many starting points for tours are not accessible by bus. 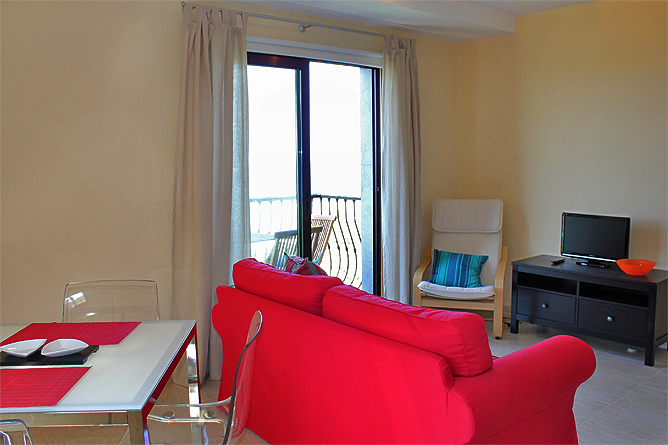 Modern and friendly Holiday Apartment with Balcony.